Dictionary with 4,500+ English/Swedish automotive terms & flash card studying. When you encounter an automotive term that you do not understand - look up the Swedish/English translation with this easy-to-use dictionary (about 4500 words). The program also contains functions for learning automotive terminology as well as a built-in quiz to test your knowledge. - Study: Learn new automotive words. 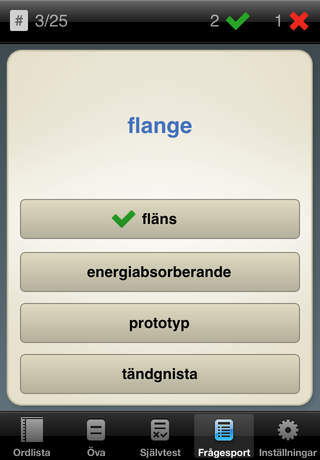 Browse cards showing the word in Swedish and English. - Self test: Test your knowledge. Tap the card to show the translation and tick off the word if you've learnt it. - Quiz: Take the quiz and get a score that shows your level of expertise. Under "Settings" you can create a new set of words to study. We also have a German-Swedish version that can be purchased separately.